Bicycle touring enthusiasts are at no loss for challenging places to ride. Bike travelers regularly test their limits by cycling over 5,000 + meter passes in the Andes, biking across remote stretches of desert in sub zero temperatures and riding through countries which many deem hostile to Westerners. But sometimes we just like to enjoy ourselves. Not worry about where our next meal or drink of water is coming from. Stop battling with bad roads and relentless winds. Forget about killer climbs and 300 kilometer stretches of road sans services. That’s when it’s time to pack up the panniers and bee-line it to Thailand. 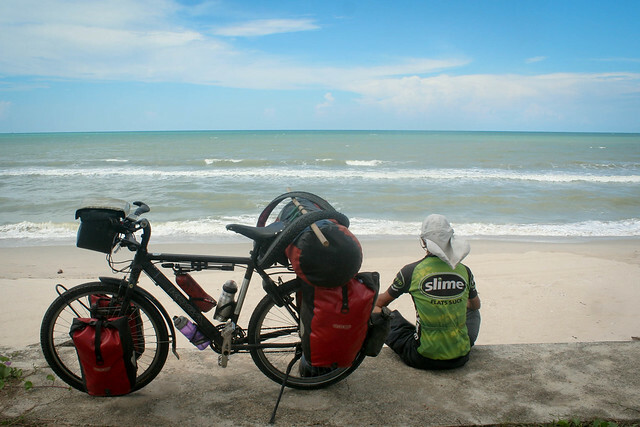 Here’s my take on why Thailand is almost certainly the easiest place on earth to go bicycle touring. The food: cheap and best! We all know cyclists spend about 80% of their waking hours dreaming of their next meal. In Thailand, your next meal is just around the corner and it probably won’t cost you more that 30 Baht ($1). And you know it’ll be delicious, because all Thai food is. 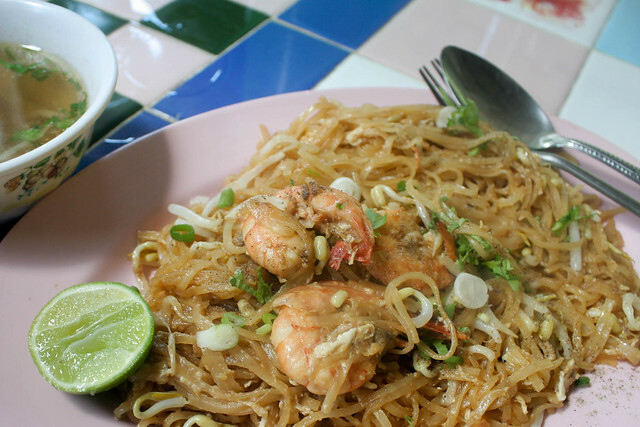 Even the smallest town in Thailand is home to a bustling market packed with food stalls. A strong iced-coffee to wake you up and cool you off or perhaps you’d like to give the deep-fried shrimp cakes a try? Don’t forget about all the spicy coconut curries, papaya salad and pork satays( for the meat lovers amongst us). And for desert give the tempting banana pancakes (roti) or the coconut ice-cream a try. Portions are small so go ahead, indulge 6, 7 or even 8 times a day for a mini-meal that won’t break the budget. 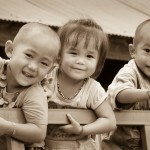 There’s no misnomer in Thailand being referred to as the Land of Smiles. Thai people go out of their way to be helpful in almost all situations. Passersby will guide you to a guesthouse, restaurant owners will exhibit an infinite amount of patience while watching you pantomime what you want to eat, random strangers will offer you food and drinks, and everybody will greet you with a warm Sawadee! Most Thai’s motto seems to be Mai pen rai—no problem. 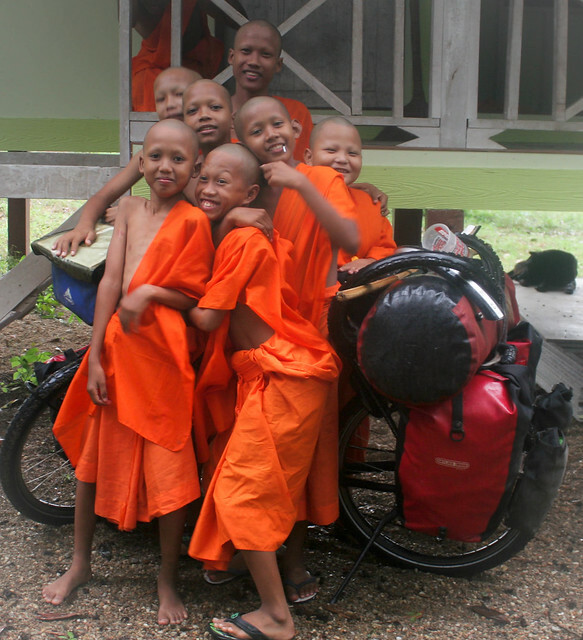 If you adopt that same attitude, you’re assured the time of your life bike touring in Thailand. Thai highways are in better shape than most highways I’ve cycled in the US! Pot-hole free and –apart from the chaos surrounding Bangkok– pretty rider friendly. Most highways have a wide paved shoulder, and if you get used to dodging the scooters coming from the opposite direction (driving the “wrong way” is accepted practice for short distances in most of Asia) you’ll find cycling so safe and stress-free you can even plug into some good music or a podcast. Give those legs a break! If you’ve just come from Laos, then those legs will need some relief. Much of Thailand is blissfully flat. If you stick to the south, you’ll encounter a few hills here and there, but fun ones. You know the kind… 5 minutes of intense effort and 60 seconds of excitement as you woosh down the other side. Bike touring, after all, shouldn’t be just about suffering. What could be more relaxing after six hours in the saddle than diving into the warm waters of the Adaman Ocean or the South China Sea? Enough said. Ever since cycling Taiwan, I’m a huge 7-11 fan. Why? The simple stuff. Free ice to keep your water bottles refreshingly cool, clean restrooms and Magnum bars for those who just don’t think they can push it any further. If you’ve been on the road for a while then you know the joy of stepping into a Western supermarket. A dash to the bakery for same freshly baked bread that’s not chock full of sugar, a walk down the imported foods aisle to stock up and peanut butter and jam and finally a trip to the chocolate section where you’ll find everything you’ve every craved. For a price, naturally. One less thing to worry about. Visas. Anyone who’s biked through Central Asia or Africa knows the frustration of the visa chase. Days, even weeks wasted begging some bureaucrat in Abuja or Urumqi for a tiny little stamp in your passport. While visits to Thailand aren’t as easy as they used to be, the process is still pretty straight-forward. Most Westerners are granted an automatic 15 day stay at land crossings and 30 days if you arrive by air. If you apply in advance (say in Phnom Penh or Vientiane) you’ll get a 60 day stay. Hassle free. Just fill out the forms, hand over the photos and pay the fee. Done. Best value accommodation on the planet. Alright, we haven’t yet been to every country on the planet, but after cycling through more than 80, we have a pretty good idea of what constitutes a good deal. And Thailand is a good deal. For around 150 Baht ($5) you can find a clean, comfortable room with fan and a shared bath. Fork over 200 Baht ($7) and you can upgrade to a room with an attached bath. A 300 baht splurge ($10) will get you the luxury of air conditioning. Feel like camping instead? No problem. 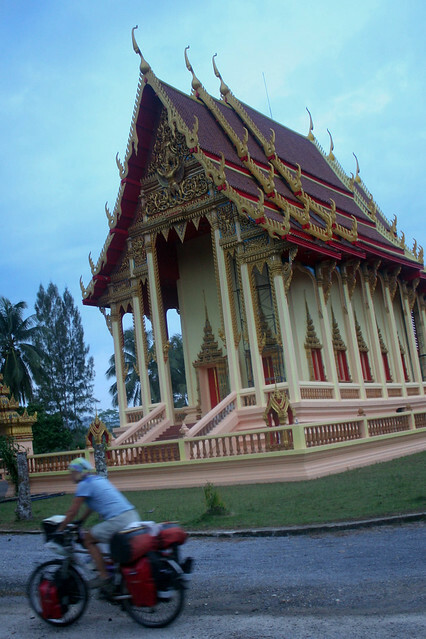 Just roll up to about any Buddhist temple in the country and you’ll be welcomed with one of those warm Thai smiles. Go ahead, pitch your tent and enjoy a peaceful night’s rest. For free. 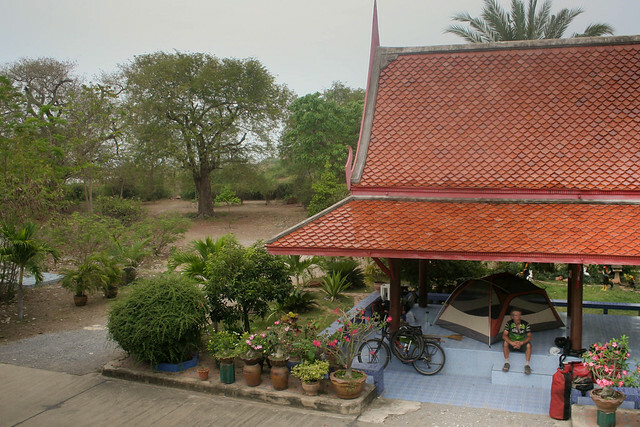 I told you bike touring in Thailand was easy….easy on the wallet. 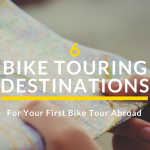 So remember…if you’re looking for a bicycle vacation rather than rough and tumble riding, then Thailand’s your spot: the easiest place on earth for a bicycle tour. 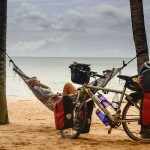 What’s your take on bicycle touring in Thailand? Any other countries you can suggest for an easy bicycle tour? Thanks for the article, I’m tempted. As for other easy locations, Japan is easy on all accounts except the bank account – it’s nowhere near Thai prices. Can anyone give us an idea of what Japan costs on a daily basis? That is just so TRUE ! a 7/11 now ! Please ! Great article. I love Thailand, even bought a local bike when I volunteered there once, but I hadn’t thought of it as a touring destination, hmmm… I note the stick easily at hand on the back. For dogs I take it? Much of an issue? Actually the stick was intended as a kick-stand…since repaired but you never know how long that will last so I keep the stick. Dogs aren’t a big problem in Thailand, lots of strays and they do give chase but they’re hardly vicious. 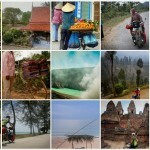 Cambodia is even less expensive and more flat than Thailand. 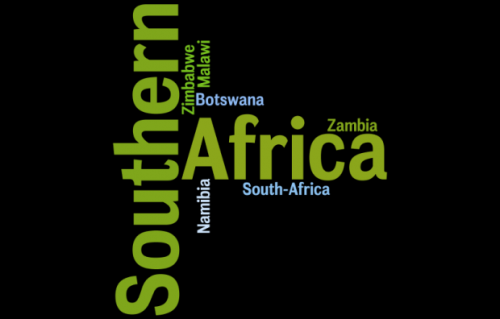 Both countries are ideal for first time experience in exotic surroundings. It’ s really hard to leave after weeks of comfortable temperature and nice people. I absolutely agree. I lived in Thailand for one year. And yes, Thailand rocks. The people, food, culture etc are just overwhelming. Thailand is hard to heat! Great to hear you had a great time in Thailand! My daughter just returned there to teach English and Yoga. We’re a little distressed that she’s 12 time zones away, but hearing from yet another source that Thailand is a good place to be, except in the south, makes us feel better about her new home. Thailand (EXCEPT for the far south) is absolutely one of the safest and most friendly countries on earth. No need to worry about your daughter and I suggest you start looking for tickets so you can go for a visit. Very cheap flights available with Air Asia! Well , happy to see that everything is going so smooth after the hard times of Bolivia and Yukon . Yukon is for me after the Yellowstone . I hope I will be more lucky than you !!! Then back to France , a visit to the family (complicated , my daughter is in Rio now) , and Australia or New Zealand . Love the blog. How did you guys know you would be able to camp in the buddhist temple. Is that common knowledge that they welcome everyone in. Thailand is definitely the lest place on my list. Sounds like your bank goes a lot further now. Thanks for the story and photos. Team – so happy to read this. 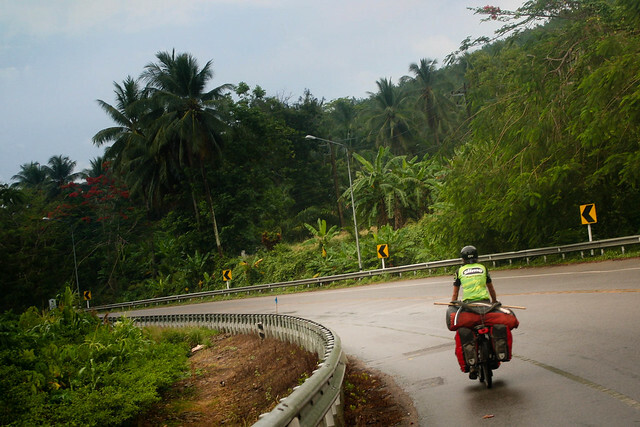 We are cycling up through Malaysia and just about to enter Thailand. 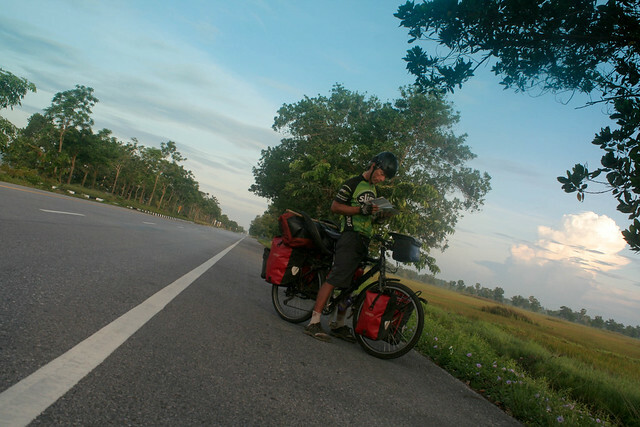 We have been on the road for 2 years, but Malaysia is the first Asian country for us as we work our way north. It has been a fantastic place to ride and has such friendly people.